"Digicel has renewed its support of the Haiti Football Federation in a multimillion dollar deal over the next four years. In addition, Digicel also donated vital office supplies and equipment to the Federation whose building was destroyed in the earthquake on January 12." You can help too. Donate to Haiti Women's Soccer through our site. 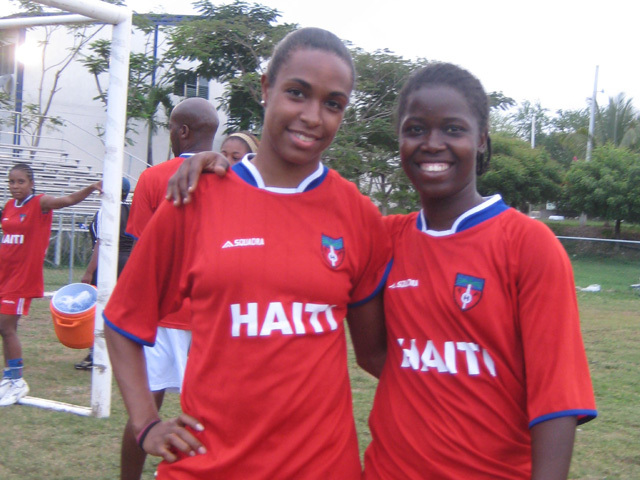 You can also view recent donations received and support provided by Haiti Women's Soccer. L’ équipe nationale féminine senior vient de faire la plus grande remontée de son histoire dans le dernier classement FIFA datant du mois de mai. De sa 106ème place au monde en Mars 2010, Haïti est maintenant classé 58ème au monde, donc un bond de 48 places. Par ailleurs, Haïti est déjà à deux pas de l'objectif à court terme fixé par le nouvel entraîneur-chef Dalexis Gaspard, une place parmi les quatre meilleures équipes nationales de la CONCACAF. L’équipe nationale féminine senior est actuellement sixième dans la région de la CONCACAF soufflant dans le cou des meilleures équipes de la region: États-Unis, Canada, Mexique, Trinidad and Tobago et le Costa Rica. 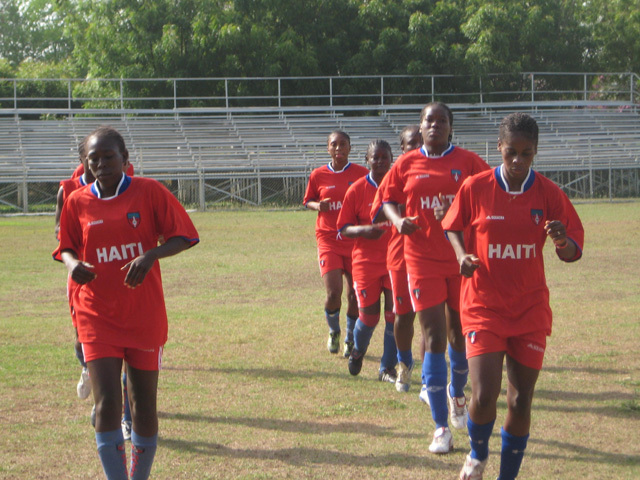 Haiti National Women’s Soccer Team has just made the biggest move of its history in the last FIFA Ranking of May. From its 106th ranking in the world in March 2010, Haiti is now ranked 58th in the world, thus a move of 48 places. Also, Haiti is already two steps from the short term objective fixed by the new Head Coach Gaspard Dalexis, a place among the top four national teams in the CONCACAF. The Haiti National Women’s Soccer Team is currently 6th in the CONCACAF region blowing in the neck of the top teams USA, Canada, Mexico, Trinidad and Tobago and Costa Rica. The Haitian National Women´s Soccer Team played Tuesday May 4th its toughest opponent yet, the Dominican Republic U17 Boys National Team. The Haitian´s coaching staff wanted to challenge the women national team against a stronger, faster, quicker and more skill opponent. Indeed the boys side was all that. So, the game was very balance for most of the time. However after just a few minutes into the game, it was obvious that only one player from the boys side was causing most of the trouble to the Women defense. At barely 5 feet tall and lightning quick, he wore number 17 and played center forward. Final Haiti National Women´s Soccer Team 3-2 over the Dominican Republic National U17 boys team. Haiti next game will be against Antigua and Barbuda in Trinidad. Here are some photos from the May 2010 training camp. 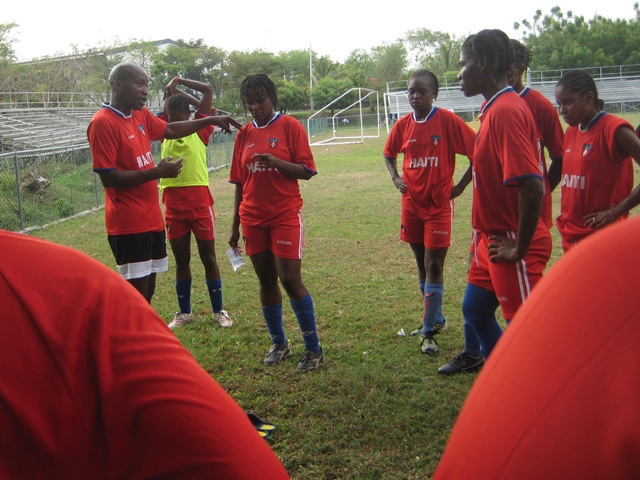 On Saturday afternoon, Haiti National Women’s Soccer Team played its second exhibition game under Head Coach Gaspard Dalexis. The game took place at the San Cristobal Stadium against the Dominican Republic U17G national team. There were probably almost five hundred spectators who mostly came to attend a mass celebration that was held in the stadium at the time of the game. With the inspiration of the gospel music and chant that was on the background, Haiti National Women’s Team took control of the game from the start, by imposing on the young Dominican a quick and simple passing game that the coach called the Haitian style of soccer, “Sharing makes you Better” The ball was certainly shared among the Haitian players and the Dominican spent most of the game chasing the ball all over the field. Out of the nine Haiti National Women’s Soccer Team goals scored, there were eight different scorers and almost sixteen total assists. 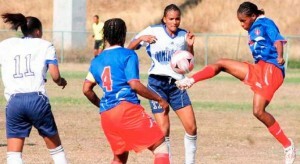 One should applaud the Dominican National U17G Soccer Team for a valiant effort… The battle hard and never gave up. Une mauvaise note du match: Nous avons subbi la perte, du très jeune et très douée, de l’attaquante de 18 ans BOBO, en raison d'une épaule disloquée et fracturée. Le père de l’entraîneur-adjointe Yvette est décédé hier…Quoique Je n’ai jamais eu l’opportunité de le rencontrer je suis convaincu qu’il fut une personne digne, bien et soucieux de son prochain tout comme sa fille, Yvette. A travers elle, sa vie continuera sur cette terre. Au nom de l’equipe nationale féminine senior et la fédération Haitienne de Football et tous les fanatiques, je présente mes sincères condoléances a sa famille, ses proches, ses amis…Nos prières et nos pensées sont avec vous. After several weeks of practices and four days with the head coach Gaspard Dalexis, the National Women’s Soccer Team played finally its first exhibition game. It was against a young and talent U15 Boys team AS Truitier of Carrefour, Haiti. Although the National Women’s team scored just 25 sec into the game however for several minutes the young boys were controlling the game with their slick passing. But, the National Women’s Team made the necessary adjustments and took control of the game with some slick passing on their own. Therefore, it was quickly 1-0 when a Batard header found the back of the net of a cross from Saintilmond. Two minute later, Libertin scored the national team second goal on another header. This time it was a cross from Aristlilde that met in timely fashion Saintilmond forehead. Even though, the score final was 10-1 in favor of Haiti Women’s national team, the boys battle very hard from start to finish. The National side played a good game but is a long way from what that is expected from them. One bad note: We loss the very young and talented 18 yrs old forward, BOBO due to a dislocated and fractured shoulder. Thursday, April 1. SAN CRISTOBAL, Dominican Republic – Wisline Dolce scored with six minutes remaining, her second goal in as many games, to give Haiti a 2-1 victory over the Dominican Republic on Tuesday, earning the beleaguered nation a berth in the second round of the Caribbean's Women's Gold Cup qualifying. The goal by Dolce, who also had one in a 5-0 victory over the Turks and Caicos Islands on Sunday, finished Haiti atop Group D with six points. The Dominican Republic, which also beat the Turks and Caicos3-1 on Friday, finished second with three points. Haiti joins Guyana, Puerto Rico and St. Lucia, which also won their groups, in the second round, to be contested in two groups of four teams (in Cuba, May 10, 12 and 14). The second-round group winners will qualify for the Women's Gold Cup in late October-early November while the group winners, best runner-up and host Puerto Rico will qualify for the Central American and Caribbean Games in July.